Is analyst relations an extension to public relations? 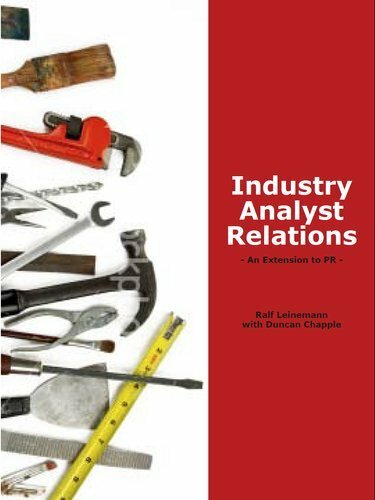 “Industry Analyst Relations – An Extension to PR”, the book by Dr Ralf Leinemann and I, has been the best-selling AR book on Amazon over the last five years. We’re delighted to announce that the book is now available as an eBook from Amazon, and as free PDF from Kea (see below). It’s not a success we expected. We’re proud of our book, but Louis Columbus wrote a better introduction for new practitioners, which he gives away for free (PDF). Efrem Mallach’s masterful Win Them Over, soon to be in its third edition, is the only comprehensive AR manual for managers. Richard Stiennon’s book on influencing Gartner is excellent, and is set to outsell all other books on AR. The success of our book has happened not only despite the value of these other books on AR, but also despite our subtitle: “An Extension to PR.” This subtitle still causes occasional misunderstandings among those who have not read beyond the cover, and it’s worth explaining what the book is, and what the subtitle means to me as one of the authors. Ralf brought to the book his substantial experience from a series of PR and marketing roles at HP which began in the 1980s and ran through to 2006 when he became MD of Matchcode in Germany, one of Kea Company’s partners. Both of us had led projects to help public relations professionals to make the most of analyst relations, and that’s what the book came from. In some organisations public relations has a narrow scope: it often focusses on the media (The joke used to be that some people thought PR stood for press release). But, as every book on PR explains, PR is more than media relations. PR is about the public, and journalists are just one important layer of the public: investor relations, social media, events, influencer marketing and media relations are all forms of public relations. Most firms have a substantial advantage if they identify all their audiences and ensure that the right resources are targeted onto communicating with them. Through strong brand alignment and co-ordination, these different PR activities are able to multiply their force and effectiveness. When we referred to AR as an extension to PR, we meant it in that way: public relations should be extended to include AR in order to build AR more closely into the company. If you read through our book, you’ll see that we aim to explain what AR is by using language that PR managers will understand. That reflected our primary purpose: to educate PR directors and other senior managers about AR so that they added AR into their budgets and their communications plans. Without reading the book, some people got a different idea. They thought we were arguing that AR was a media relations activity; that media relations people should be doing AR; or that AR strategies should be subordinated to media relations strategies. Our book does not argue that. But the reaction to the subtitle shows the depth of the problem which arises when people think PR means exclusively media relations. We don’t share that view and, insofar as using PR in its broad original meaning has provoked discussions, we’re happy with our subtitle. In particular, we’re happy with the form of words “An extension to”. Perhaps this form of words is clearer in Ralf’s native German, but extending to something doesn’t have to mean becoming an assimilated part of it. If I extend my arm to the sky, it does not become sky. If I extend my porch into the lawn it does not become lawn. Analyst relations is a form of public relations, but the different PR disciplines are not best done identically, no more than you would cook every meat in the same way, or think a teacher would be interchangeable with an astronaut since they are both public servants. That said, we don’t think there is space for complacency about the isolation of analyst relations. Quite the opposite, AR is struggling to deliver the desired value to the business in many firms.Our sales enablement audits show how very isolated AR often is. Ironically, the more isolated AR is the more it depends on the news flow from media relations. Luckily, the opposite is also true. We think, and the other authors we have mentioned surely share the view, that becoming a Leader in the MQ, or in analyst relations generally is “a whole-of-company endeavour”, to take Richard Steinnon’s phrase. That’s why Richard’s book is so smart: he advises AR folks on how to deflect the responsibility for location of the dot in the MQ onto the business and how to devise a strategy to accomplish that. The more entwined AR is with the rest of the business, with the brand and with the customer experience, the more effective it is. And that’s why we continue to argue for the PR goals of a firm to extend to all its publics, including industry analysts. To find out more, you can buy the book on Amazon or get a free PDF by contacting Kea Company. This entry was posted in 6. Features, Develop AR, Papers & eBooks. Bookmark the permalink.